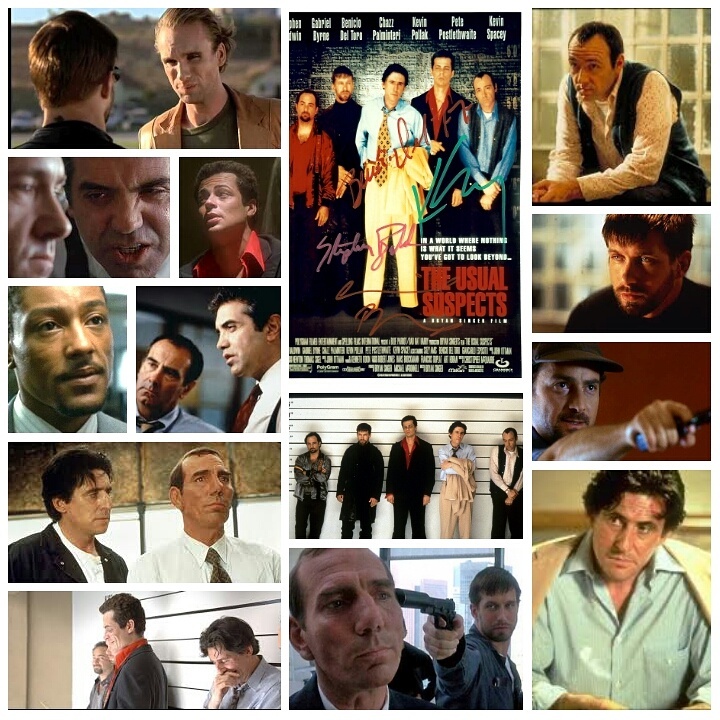 No matter how many times I watch The Usual Suspects, and believe me it’s been many, I still get the same diabolical thrill, the same rapturous excitement and the same rush of storytelling and dramatic payoff as I did the very first time I saw it. Every performance from the vast and diverse cast is a devilish creation packed with red herrings, juicy dialogue and bushels of menace, every scene piles on the mysticism of the criminal underworld beat by beat, until the characters begin to pick it apart and the whole thing unravels like a great serpent coiling forth bit by bit, scale by scale, swerving toward the shocking, disarming third act that has since become as legendary as it’s elusive and terrifying antagonist. In the crime/mystery corner of cinema, there’s no arguing that this delicious piece of hard boiled intrigue reigns supreme, and it’s easy to see why. In a seemingly random police lineup, five career criminals are harassed by an unseen hand, pushed into carrying out dangerous heists and violent manouvers by a shadowy campfire tale among the world of organized crime, a Boogeyman called Keyser Soze, if he even exists at all. Slick and sleazy ex cop Dean Keaton (Gabriel Byrne) heads up this dysfunctional crew of vagabonds which includes hothead McManus (Stephen Baldwin in a role originally intended for Michael Biehn, which kills me to this day), weirdo Fenster (Benicio Del Toro, using an indecipherable mishmash of an accent that would be the first of many), spitfire Hockney (Kevin Pollak) and Verbal Kint (Kevin Spacey) the runt of the litter. The lot of them are intimidated into performing risky enterprises by lawyer Kobayashi (Pete Postlethwaite) until the climate of their actions reaches a boiling point and answers emerge from the darkness. This is all told in retrospect by Spacey, to a rabid customs agent (Chazz Palminteri) who has designs on ensnaring Soze. Spacey scored Oscar gold for his heavy work here, spinning a tale whose layers interweave and pull the wool over our eyes time and time again before offering any glimpses of truth. Byrne is a fiercely guarded storm as Keaton, a man with secrets so deep even he doesn’t know who he is anymore, letting the anger set and smoulder in those glacial eyes of his. The supporting cast adds to the class and confusion terrifically, with fine work pouring in from Dan Hedeya, Suzy Amis, Giancarlo Esposito and a wicked cameo from Peter Greene, who provides a moment of inspired improv. The score of the film rarely relies on dips and swells until all is said and done, keeping a tight lid on the orchestra and feeding us nervous little riffs of anxious portent that keeps tension on a tightrope and anticipation on call. A mystery this tantalizing is irrisistable the first time around, but the trick is to make your story rewatchable, and I’ve seen this thing over a dozen times. Every viewing provides some new angle to the story I didn’t see before, or I notice a subtle interaction in the very naturalistic and funny dialogue which escaped me in the past. My favourite thing to do is watch films with someone who hasn’t seen them before, observe their reactions and opinions on every little story beat and cinematic flourish, it’s almost more fun for me than the actual film itself. The Usual Suspects is a showcase piece for that activity, because you get to see this very complex revelation unfold through new eyes as you watch them experience the revelations. Whether your first viewing or your fiftieth, it never loses its power, and the spell it casts just doesn’t dim. Masterpiece. Lee Tamahori’s Mulholland Falls gets a bad rap in some circles for being boring and uneventful despite its charismatic cast and opulent setting that’s ripe for peppy action sequences. I think they are confusing boring with the concept of a paced and very slow burn, yet one with all the texture and richness of an action film, one that admirably decides to take the route of the old school noir, with loving care put into story and character, two elements which the action and violence live simply to serve, and not to take the driver’s seat against. Or it’s simply not some people’s cup of tea, which is totally okay too. Personally though, I love a good L.A. cop yarn that has a story to go with the toughness. This one bears striking similarity to 2013’s Gangster Squad, which also had Nick Nolte playing a 1940’s Los Angeles cop in charge of a squad that operates outside of the law. That film is pure cheese, all razzle dazzle and no plot. 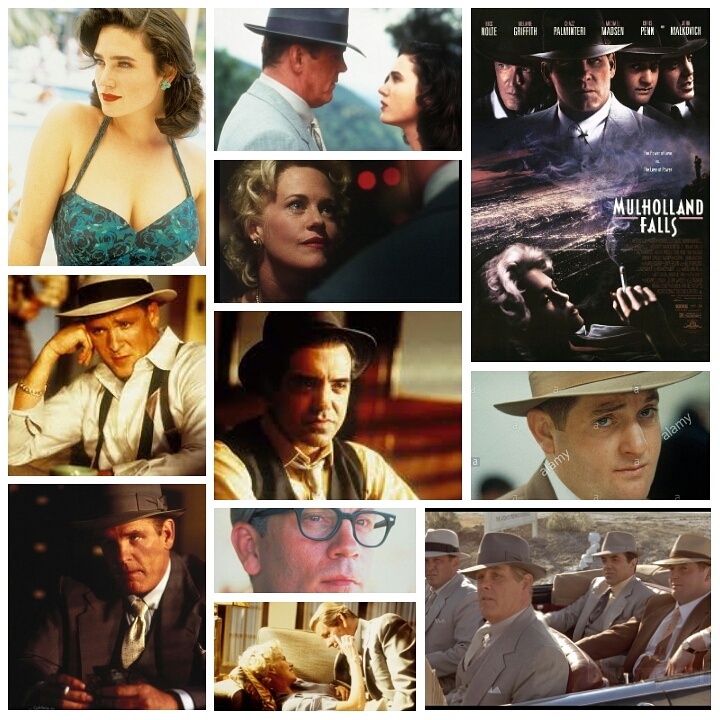 Mulholland Falls falls somewhere between Gangster Squad and L.A. Confidential; not quite up to delving into the serpentine intrigue of the latter, yet infinitely more interested in telling a worthwhile story than the former. And tell it does, in high flying style that only a crime film set in that time period can do. Nick Nolte plays Hoover, a whiskey voiced, take no prisoners LAPD badass who heads up an elite anti corruption task force that operates far outside the red tape and pretty much do what they want to stomp out corruption. His squad consists of Michael Madsen, Chris Penn and a scene stealing Chazz Palminteri as the oddball of the bunch, with serious impulse control issues. A straight up dream cast of tough guys, and although I’ll admit that Penn and Madsen are a tad underused, their presence alone boosts the film’s credentials into an epic pantheon. The film revs up with a kicker of an opening sequence in which the squad severely roughs up a troublesome mobster (an uncredited William L. Petersen). “This isn’t America, it’s Los Angeles” Nolte growls to him, stating the tone of perverse lawlessness which permeated the city back then. Soon he’s drawn into a tawdry scandal involving the murder of a young prostitute (Jennifer Connelly) who he previously had encounters with. The search leads him far and wide, crossing paths a sleazy photographer (Andrew Mcarthy), a dying air force tycoon (John Malkovich manages to ham it up even at his most laid back) and his stern lieutenant (Treat Williams). Nolte also has a poor jilted wife played nicely by Melanie Griffith in limited but effective screen time. The plot is hard boiled to the bone, with Nolte in one his most gruff mid career roles and loving every stressed out, rage fuelled second of it. The conclusion is his show, with a whacked out Palminteri in tow for a spectacular sequence set aboard a doomed military aircraft. The cast gets deeper, believe it or not, with Daniel Baldwin, Ed Lauter, Kyle Chandler, Titus Welliver, Louise Fletcher, Rob Lowe and Bruce Dern contributing gamely. This one’s got style on it’s side and then some, replicating a sense of time and place with the torque ramped up to near Sin City levels. Admittedly not perfect, but a pure and simple blast of a flick, in my opinion. They say timing is everything and this certainly applies to the release and reception of movies. Case in point: Mulholland Falls (1996). Released a year before the very similar L.A. Confidential (1997), it was also a retro-neo-noir set in 1950s Los Angeles and featured a murder mystery leading to a vast conspiracy. However, Falls was promptly blasted by the critics and quickly disappeared from theaters while Confidential became the toast of critics and received awards from all over the world. So, what went wrong? Falls featured an impressive cast of solid character actors (it had more name actors than Confidential) and a critically acclaimed director with Once Were Warriors’ Lee Tamahori as opposed to Confidential’s Curtis Hanson who had only done adequate B-movies like The Hand That Rocks the Cradle (1992) and The River Wild (1994). Now that a few years have passed, Mulholland Falls has aged surprisingly well. Set in 1953, the first image is one of a mushroom cloud from an atomic bomb explosion. It is one of the enduring images from that era and one that hangs like a shadow over the characters and events in the film. Max Hoover (Nick Nolte) leads a group of four cops known as The Hat Squad who do things their own way, like bullying out-of-town gangsters and dropping them off one of the deserted stretches of Mulholland Drive (aka “Mulholland Falls”) as a deterrent for setting up shop in L.A. One day, Max and his crew – Coolidge (Chazz Palminteri), Eddie (Michael Madsen) and Relyea (Chris Penn) – go out to a construction site to investigate the murder of a beautiful woman (Jennifer Connelly) who has been literally pressed into the ground. There is a shock of recognition on Max’s world-weary face. His connection to the dead girl and his subsequent investigation into her murder leads to a dangerous conspiracy involving the United States government and a mysterious General Timms (John Malkovich), head of the Atomic Energy Commission. After the success of Once Were Warriors, Tamahori was offered many projects before finally choosing Mulholland Falls. Michael Mann was originally attached to the film but left at some point. One of the first things that is so striking about this film is the gorgeous attention to detail with vintage cars, suits and music from the period. This is enhanced by the gorgeous cinematography of the legendary Haskell Wexler who evokes classic film noir in every frame of Mulholland Falls. Tamahori assembled an impressive crew including the likes of production designer Richard Sylbert, who worked on Chinatown (1974) and The Manchurian Candidate (1962), and Wexler, who won an Academy Award for Who’s Afraid of Virginia Woolf? (1966) and worked One Flew Over the Cuckoo’s Nest (1975) and In the Heat of the Night (1967) amongst others. Tamahori says that people within the industry were surprised that he hired veterans like Sylbert and Wexler and realized that Hollywood was being run by young executives: “It’s a kind of youth-oriented thing, and—blast, blam, blam, blam, make the action for the under-25-year-old crowd. Do this, do that, you’ve got to be on top, you have to be fast. They see age as being old and boring.” Mulholland Falls consciously eschews this approach for a slower paced, more thoughtful vibe that harkens back to films made before music videos and their kinetic editing changed the way films were made in Hollywood. With his gravelly voice and weathered good looks, Nick Nolte is well cast as the conflicted tough guy, Max Hoover. If there is one significant problem with the film it is the lack of screen time given to the excellent members his crew. They are given little time to develop their characters with only Chazz Palminteri edging out the others. Palminteri plays Nolte’s best friend and second-in-command. He’s the most sensitive of the bunch (although, that’s not saying much) because he’s seeing a female psychiatrist and this makes him the voice of reason, often curbing Max’s more self-destructive impulses. Tamahori met Burt Reynolds and Tom Arnold for the role of Coolidge but felt that Reynolds was a little old for the role. Little time is devoted to developing the chemistry between them. The filmmakers should have used The Untouchables (1987) as inspiration – although, the crucial difference is that in Brian De Palma’s film we see how Eliot Ness and his crew come together while in Mulholland Falls, Max and his group have been together for some time. Pete Dexter’s screenplay doesn’t do a good enough job making us believe that they are a tight-knit crew. That being said, the chemistry between Nolte and Palminteri begins to kick in towards the end of the film but it is too little, too late. The casting of actresses Jennifer Connelly and Melanie Griffith is right on the money as they both have the voluptuous body type common to that era, especially Connelly who has curves in all the right places and that were also used to great effect in The Rocketeer (1991). Sadly, Connelly and Griffith aren’t given too much screen time but this does give Connelly’s character something of an ethereal, mysterious quality that is quite haunting and works well in the film. John Malkovich essays yet another one of his cultured bad guy roles as General Timms. The first meeting between him and Nolte is good as we watch two different acting styles bounce off each other. Timms tries to dazzle Hoover with philosophical double speak while the cop plays dumb but subtly applies pressure on the scientist. What is so interesting about this scene is what is not being said. Watching this film again, I was struck by the eclectic cast featuring the likes of Treat Williams, Andrew McCarthy, Bruce Dern, Daniel Baldwin, William Petersen, and Rob Lowe. There is somber tone that hangs over Mulholland Falls and the ending is refreshingly downbeat (unlike the very classic Hollywood ending of L.A. Confidential) evoking Chinatown of which it was most often compared to. Like any good noir protagonist, Max’s shattered life stays shattered. The murder has been solved but at a terrible cost to his own life. While Falls is a flawed film and certainly not as strong as Confidential, it is not an awful effort by any means and actually has a lot of merits. It is definitely worth another look if you haven’t seen it since it debuted or if you’ve never seen it before.